On October 1, 1938, Hugues Panassié and Madeleine Gautier boarded the Red Star liner S.S. Pennland in Antwerp, Holland. In his book Cinq mois, Panassié only once, and almost by accident, acknowledges that Madeleine Gautier was following him on this trip. This evidently was a delicate thing as Panassié was married and had two children at that time. He later on married Madeleine Gautier, but this marriage was not officially recognized after his death. They arrived at Hoboken, New York in the morning of October 12th and were met by Panassié’s agent Larry Cunningham and Milton Mezz Mezzrow, Benny Carter and other musicians. 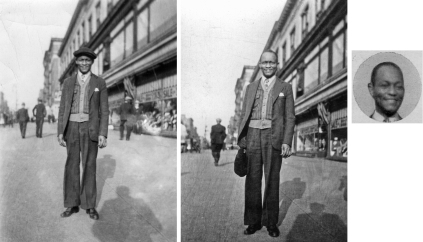 Mezzrow then invited him to stay with the Mezzrow family at 126th Street near 7th Avenue in Harlem. Panassié’s main mission for this U.S. visit was to make records for the Swing label. The important goal has been summarized in his book. On November 7th, Panassié and Mezzrow decided they had to make a serious effort to get in contact with Tommy Ladnier. This night, after dinner, I proposed Milton to walk by foot in Harlem and ask everywhere for news on Tommy until we got some positive results….Milton said to me: “I recall that Tommy loved to play pool, perhaps are there some of his acquaintances in this pool room.” And he stepped into the pool room and shouted in a voice loud enough to be heard by everyone: “Does anyone here know Tommy Ladnier?” No answer. After having waited for some time, we returned to the sidewalk to continue our walk when we heard someone with rapid pace coming behind us; one of the pool players chased us and said: “Did you want some news on Tommy Ladnier? I am one of his friends. I have a letter for him in my pocket that I am going to mail. Do you want to give him a message?” I was overwhelmed by joy. The man added that Tommy lived in Newburgh, about sixty kilometers from New York. I took my notebook and scribbled some lines asking Tommy to come rapidly to New York for recording the discs. Towards noon, there were ringing sounds from the doorbell in our apartment. Mae opened and announced “Tommy Ladnier”. I jumped for joy and rushed into the living room. For seven years, I had not seen him! He had not changed at all. I said, “Tommy, I have been worried about you. Rumor told that you had gone mad and was locked up in an asylum.” “I may be mad, but am not yet shut up” he smilingly answered. Tommy accepted kindly to record the discs… Because he disliked the exhausting life in New York, Tommy told me that for some years he had been living in the countryside or in small villages, giving trumpet lessons or playing in small bands. He promised to come back soon. I followed him down to the street and took some photos. These photos have been preserved, showing a seemingly healthy and smiling Tommy. His clothes are simple and his trousers are baggy, but he has a handkerchief elegantly tucked into his breast pocket and he still uses a cap. His knitwear in contrast to the striped tie and white shirt makes him look more European than American. In his left hand, he holds what seems to be a cigarette or a cigar – or perhaps even a pipe. In fact, Panassié shot at least one more photo later on used by Swing in the record catalogue. In this photo, Tommy is showing his widest smile and the difference between a “sulking” Tommy and a smiling Tommy is again evident, just as Panassié has described. One reason why Panassié shot these street photos was that he was not entirely convinced that he would ever meet Tommy again, fearing that Tommy would disappear once more, and this time for good. Tommy, however, stated that he would love to take part in the planned recording session. 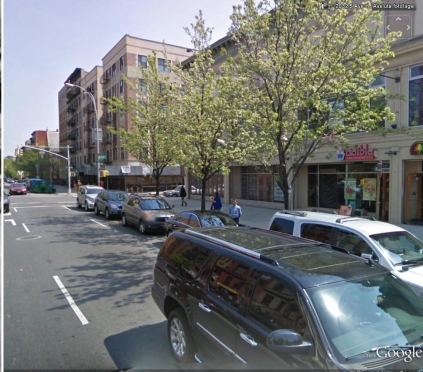 With the help of the excellent Google Earth Street view, it is possible to establish the exact location where these photos were taken at 2034 5th Avenue at 126th Street. Fortunately, the buildings along 5th Avenue are still there – at least they were there when the Google photos were shot in 2006 – although some of them have a modified exterior. Especially the three house fronts in the background across 126th Street prove the location. Across the street on the opposite corner is the location of the Mezzrow flat at 1 West 126th Street. It is not known if this house today is the same as in 1938, though. You can download the complete document below.